A theme of the 2019 NCCN Annual Conference was the expansion of biomarker testing to guide treatment, and a review of brand-new changes for guidelines in colorectal cancer was no different. An updated guideline (version 1.2019) from the NCCN for the management of ovarian cancer recommends specific PARP inhibitors for the treatment of recurrent disease, describes patient selection criteria for each agent, and establishes criteria for PARP inhibitor maintenance therapy. 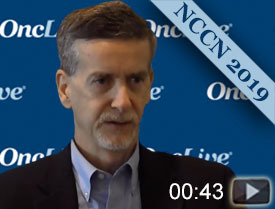 Thomas W. Flaig, MD, discusses the latest updates to the NCCN guidelines for the treatment of patients with muscle-invasive bladder cancer and highlights the latest approvals of checkpoint inhibitors in this patient population. 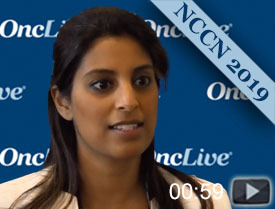 PD-L1 testing, while an imperfect biomarker, is the key determinant of frontline immunotherapy selection in the NCCN guidelines for non–small cell lung cancer. With careful monitoring, discontinuation of TKI therapy is considered safe in adult patients with chronic myeloid leukemia in the chronic phase, who achieve and maintain a major molecular response. Emmanuel S. Antonarakis, MD, discusses the prevalence of mismatch repair and homologous recombination deficiency genes and how they may play a role in determining a patient’s treatment plan in addition to promising agents that have been introduced to the field in clinical trials. 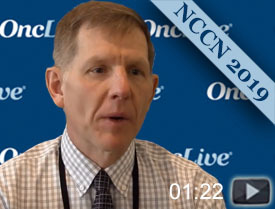 William J. Gradishar, MD, discusses the latest updates in HER2-negative advanced breast cancer and the role of molecular assays in this space. In recent years, pancreatic has passed breast cancer as the third leading cause of cancer death in the United States, and by 2030 it could be the leading cause. The 2019 National Comprehensive Cancer Network guideline on the management of advanced clear cell renal cell carcinoma undergoes a major shift in risk category used to define preferred and alternative first-line treatments.